Finally! I finally got the Nikon out of the house for a few hours of shooting this afternoon. We spent some time exploring the alleys and side streets of downtown Tupelo, our new home. Today was the first day after daylight savings time ended, so I wasn’t exactly sure what the lighting would be like in the late afternoon in this part of the country. I decided to just shoot with the 50mm prime lens and concentrate on architectural and urbex details. Downtown Tupelo has some wonderful old buildings with the original brick and mortar, some with old advertisements that were painted there years and years ago. We have been pleasantly surprised at the number of restaurants, bars and coffee shops that have been opened in these old buildings, preserving the architectural details of the brick and the wood. Lots of ambiance and good food to be had here in downtown Tupelo! 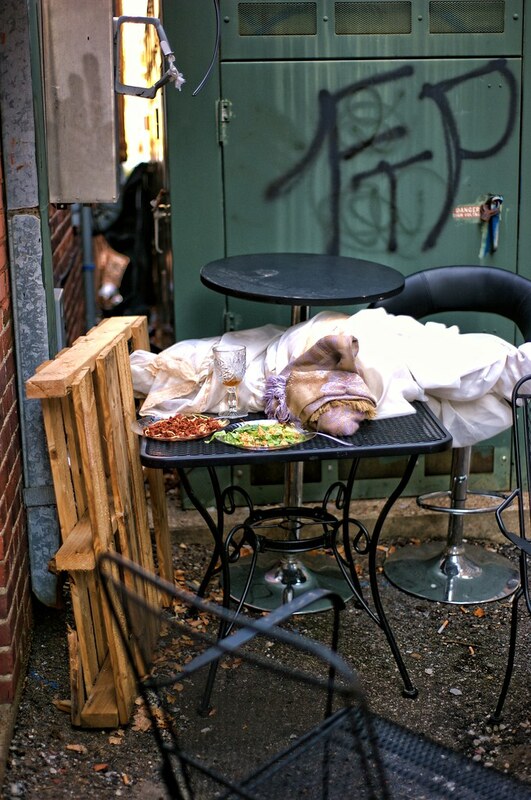 While exploring one of the alleys, we came across this table behind one of the newer restaurants, Nautical Whimsey, where it was apparent that one of the restaurant staff had been dining before he or she was interrupted. The pasta, salad and drink looked so good that we were enticed to check out their wine bar, and ended up spending two hours there. The owners, Dave (bartender) and Amanda (chef and bartender) were friendly, generous and entertaining. We each ordered a beer, and then after checking the menu, decided to try their crab cakes and the bruchetta. We were not disappointed. They get two thumbs up from us! This shot was processed in the new version of Paintshop Photo Pro X4, using Topaz Adjust. I was able to get the upgrade from X3 to X4 for $50, and I still think it’s a heck of a deal compared to Photoshop. I’ve processed six shots so far from today’s excursion, and I’ll be sharing them over the next few days, so stay tuned! This entry was posted in Commentary, Information, Processing and tagged 50mm, alley, architecture, building, camera, D700, food, Mississippi, Nautical Whimsey, Nikon, Paint Shop Pro, photography, software, Topaz, Tupelo, urbex. Bookmark the permalink. Thanks, Adam! No, it’s not an HDR, it’s a single exposure, but Topaz Adjust does a pretty good job of giving an HDR-like look in some instances. Well done, lots of range in this one. You did a great job using the available light.